SafeAnchor uses the built in GPS receiver on your device to monitor your boats position. 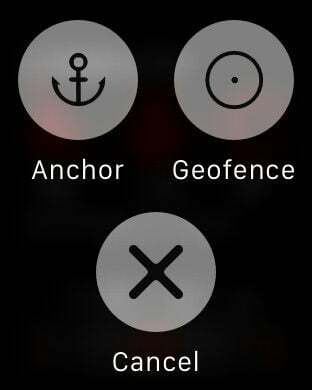 No need to have your device in hand when you cast the anchor, adjust the anchor position easily in SafeAnchor at a later time and set the alarm. If the boat drags outside the user defined area an alarm will go off. As simple as that. Now with a unique feature, set the geofence as a sector! Just double tap on the circle where you want open up, adjust to the right shape. 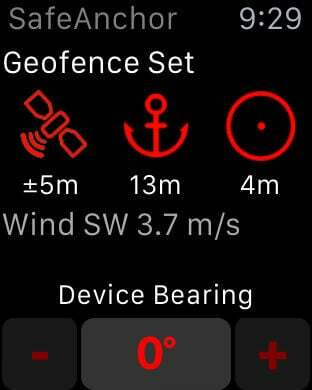 With the companion app SafeMonitor (free) you can remotely observe your boat at anchor while you're ashore. With an in-app subscription you can have the local weather for where you are at anchor, a unique feature that lets you see where likely the boats position will be next morning as well as the weather forecast next coming 8 days! You can choice how many hours (2-24h) you want to see in the wind sector and you can step through hour by hour indicating wind direction, wind speed, temperature and overall weather. It is also possible to get wind graph for the next 24 hours. See how the boat has moved over time. The tracking line will change color depending on how old the track is. With SafeAnchor you’ll see both past movements and with wind forecast also where the boat most likely will be in the future. Easily change the anchor position, drag-and-drop it directly on the satellite map, or enter the correct latitude/longitude directly. You can use any coordinate format such as D (Decimal), DM (Decimal Minutes) or DMS (Decimal Minutes Seconds). This is very convenient if you use the boats GPS plotter to make a way-point exactly where you cast the anchor. When you are all set just check the position of the way-point and enter the position into SafeAnchor. It's also possible to enter the distance and compass bearing to the anchor, very handy to fine tune the anchor position when you know you're in the line of the wind. # Drop the anchor at the current position. # Tap on the anchor and enter the correct position, or just drag-and-drop. # Set the alarm distance to the anchor. SafeAnchor gives an alarm signal if the boats distance exceed the alarm distance. To prevent false alarms you can adjust the validation time the boat is outside the safe area before an alarm starts. If the GPS accuracy gets low SafeAnchor will notify you. You can enter a e-mail address who will receive alarm alerts with a link to the position of the boat. - Continued use of the GPS can dramatically decrease battery life. It’s recommended to always use a charger when using the GPS. - iPad/iPod with WiFi only doesn't have any GPS!! For these devices to work you need a separate GPS unit designed to work with Apples devices. # The subscription will renew automatically unless cancelled more than 24 hours before the end of the current period. You will be charged for renewal within 24 hours of the end of the current period, for the same duration and at the current subscription rate for the period. # You may turn off the auto-renewal of subscriptions through your Account Settings, however you are not able to cancel the current subscription during its active period. # Payment will charged to your iTunes account at confirmation of purchase and any unused portion of previously period will be added on when a subscription to that period is purchased.